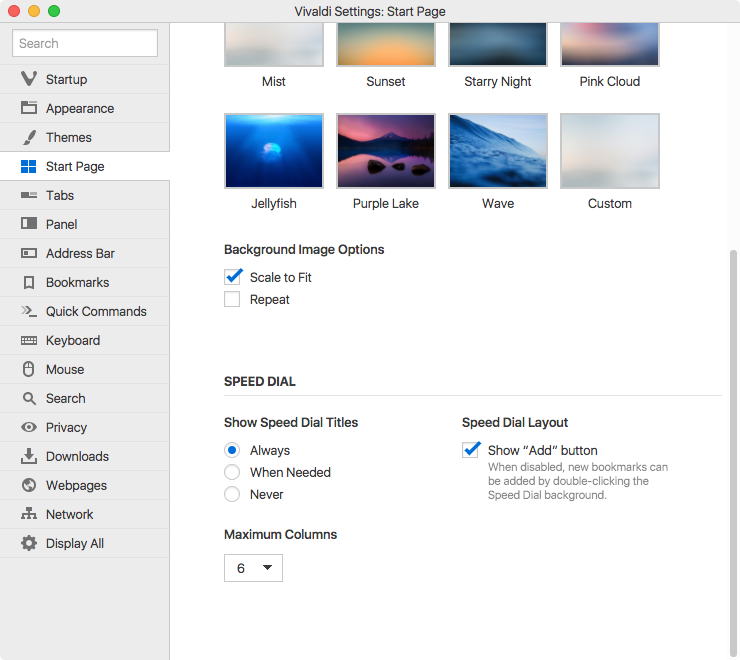 Speed Dials in Vivaldi allow you to quickly access your favorite websites from the Start Page. You can customise the Bookmarks included in your Speed Dial, or add custom Speed Dials and folders to organize your content. Click the big + button on the Speed Dial page. Hover briefly on the bookmark thumbnail, then click on the - in the upper right corner to delete the bookmark from your Speed Dial. Copy or move the bookmark to the Speed Dial bookmark folder in the Bookmarks Panel or Manager. Click the + button as if you were adding a new Bookmark to your Speed Dial, then click the New Folder button. 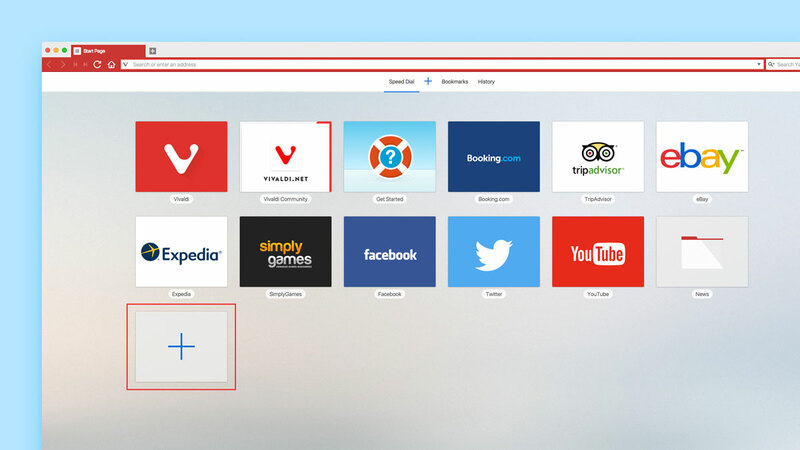 Click the + button on the Start Page navigation located next to Bookmarks and History entries to add new Speed Dial. Tip: Any existing bookmark folder can be set as a Speed Dial. 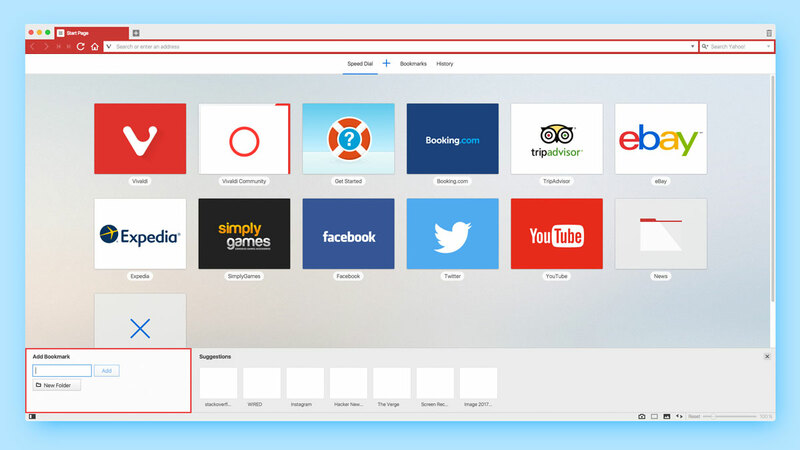 Select any bookmark folder in Bookmarks Panel or Manager and check Use as Speed Dial option. Right-click a Speed Dial icon or a Speed Dial folder and choose Select Custom Speed Dial Thumbnail option from the context menu. Alternatively, hover over the bookmark thumbnail, then click on the + to select a custom thumbnail. Upload your image to replace the thumbnail. Most image formats are supported, including animated GIFs. Go to Settings > Start Page. Tick the Show Background Image box. Choose between the pre-set backgrounds or add your own background image. To use your own, select the last option, Custom and then on Change, to select a file. [Windows 8 and above only] Your desktop wallpaper will appear in your Start Page settings by default, from where you can select to use it as your Start Page background image. 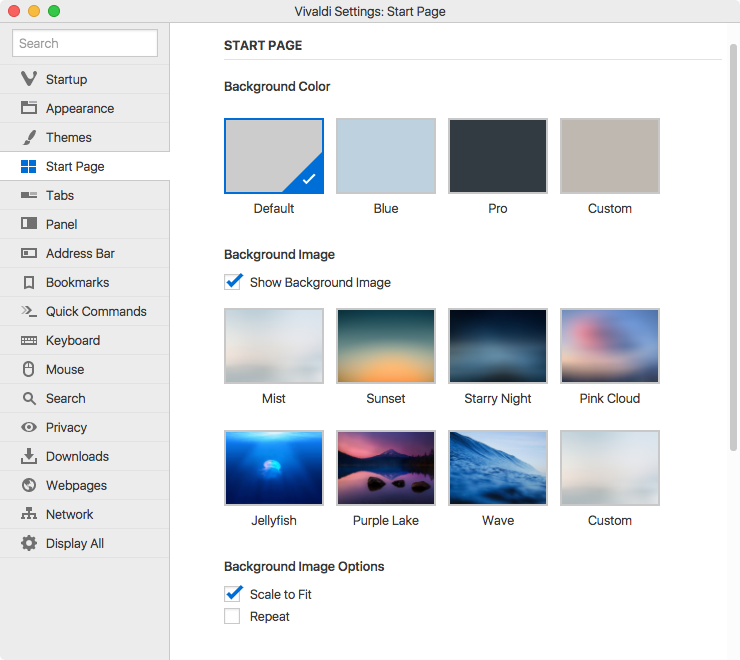 Another way to change the background is to right-click your desktop background image and select Use current desktop background picture as Start Page background image from the context menu. Toggle display of Speed Dial titles to always show, never show or only show when needed. The Maximum Columns setting allows you to set the amount columns of thumbnails to be shown per Speed Dial. Select None to let the thumbnails fill in all available space.